Did you miss the Dayton Visual Art Center (DVAC) Art Auction this year? If so, you missed out. 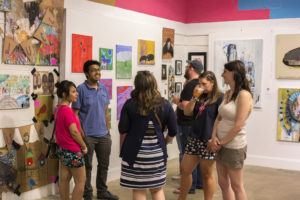 Billed as “Dayton’s biggest art party of the year,” the number of artists, art pieces, and active art lovers filling the space at the Ponitz Center confirm the hype. While the silent auction allows more tentative bidders (yours truly) to explore fascinating pieces by local artists, and raise the price in $10 increments, the live auction (hosted by Doug Sorrell) is always a treat. This year – especially so – as a beautiful piece from John Emery raised a whopping $6,100 for the cause! Food, drink, music, fun, great conversation, and competitive art bidding (don’t worry – if $6,100 isn’t in your budget, you can get much more affordable pieces through the silent auction) makes this a night to remember. But – that was last weekend. You might have missed out! How, dear friend, are you to get your own local art fix? Fear not! You can still support Dayton Visual Arts Center and talented, local artists here in Dayton by purchasing a share of the CSA (Community Supported ART!). For $650, you “buy into” the community and your share acts as seed funding to support six artists as they make fabulous work for you! Take a look at the artists and the type of work you may be able to expect. Six artists will be selected to receive a commission of $1,500 to create an artwork in an edition of 50. Artists will be selected through representative images from this application. 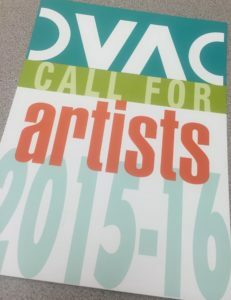 DVAC CSA Committee will work with individual artists to approve final artwork for edition. Artists must commit to creating edition between notification (Feb 13) and deadline of July 1, 2016. Commission payment 50% at agreement signing; balance at delivery. Guest juror: James Yood, adjunct Professor at the School of the Art Institute of Chicago and contributor Artforum International. All artists are eligible to apply. Emerging artists (artists exhibiting less than 3 years are particularly encouraged.) DVAC seeks to present work of the highest level of craftsmanship, originality and contemporary style. All work must be structurally sound, safe, non-toxic and fit for its intended use. DVAC will not accept commercially-produced items or structures. Media: any; but selected artists must commit to creating an edition of 50 artworks (photographs, prints, multiples, small objects, etc.) between selection (Feb 14) and deadline July 1, 2016. DVAC Member Waiver Code (at checkout). Questions, email Gallery Manager at [email protected] or call 937/224.3822. CSA-Community Supported Art is a self-sustaining economic model based on the concept of Community Supported Agriculture. The program’s products are created by artists and income is sustained by the CSA members (and possible partner organizations). CSAs are built upon connections between and the community. January 16 or 21: Open discussion/feedback session 6-7 p.m.; 1-2 p.m. In February DVAC will announce the six artists commissioned to create art editions and unveil bios and examples of their work on the DVAC website. Images will be representative of what shareholders will receive. Fifty shares will be made available to the public for $650 per share. 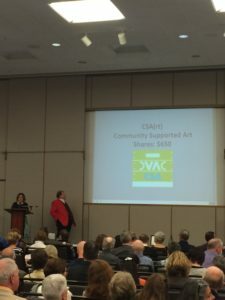 In August, DVAC will host the first annual DVAC CSA Harvest party at which shareholders will receive six original, signed works of art. CSA Art is limited edition for CSA Shareholders only—unavailable elsewhere. CSA artwork is created for the DVAC CSA in limited editions. This is what makes it, like an agricultural CSA, fresh and local. DVAC has a reach of 3,500 artists, collectors, faculty, curators, gallerists, the media and the general public; and a membership of 600. Our audience appreciates contemporary art and fine craft. In 2014-15 DVAC helped artists receive over $72,000 in art sales commissions. 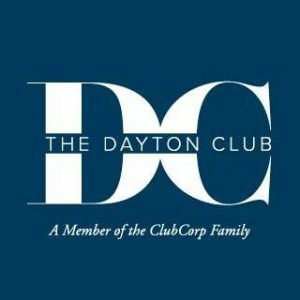 The Dayton Racquet Club sits on top of the Kettering Tower, offering an amazing view of the city from any window you choose. Heading into this venerable Dayton establishment is special for any reason. This past Thursday night was no different; people mingling, smiling, and filling the 29th floor of the Kettering Tower with light conversation and laughter. If you did not know better, you would think that this was a family reunion. Everyone knew each other, and any stranger that came up was warmly greeted and introduced to the rest of the group. You would have been hard pressed to find two people in the room that were complete strangers. The only difference on this night is the main focus of the room. 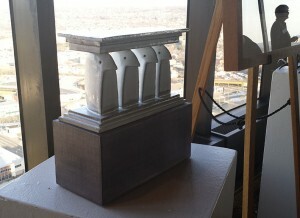 The views of all things grand in Dayton fades back as thirteen pieces step into the spotlight. The thirteen pieces of art ranged from photography to ink drawings, from sculpture to charcoal drawings. 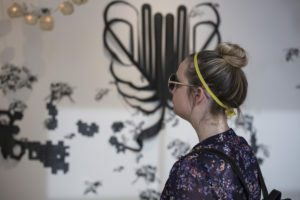 This gallery represents just a fraction of the art that has been purchased over the past 20 years through various shows, Artist’s Palates, and auctions sponsored by the Dayton Visual Art Center (DVAC). DVAC is celebrating the 20th anniversary of this yearly tradition. 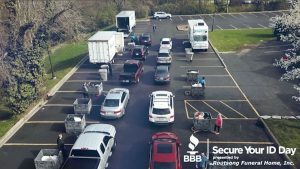 The actual auction this year is on April 25th, but on this past Thursday evening they had a kickoff party leading up to the main event. 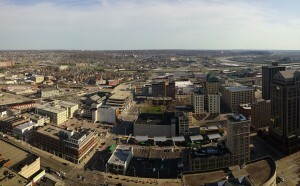 Being on the top floor in the tallest building in Dayton can almost be seen as a metaphor of how far this institution has come. DVAC started in 1991 in the Biltmore Hotel, where they were able to set up a small gallery for local artists to share their work with the community. 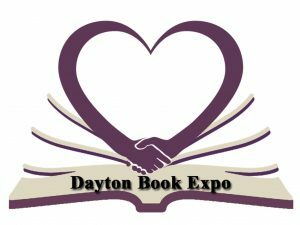 Their goal was a simple one; expose Dayton to the original artistic talent they had in the city and provide a setting for art lovers to meet and discuss their passion. They had a few fundraisers in the early days through various shows, such as their Masquerades where they invited artists to create masks for auction. 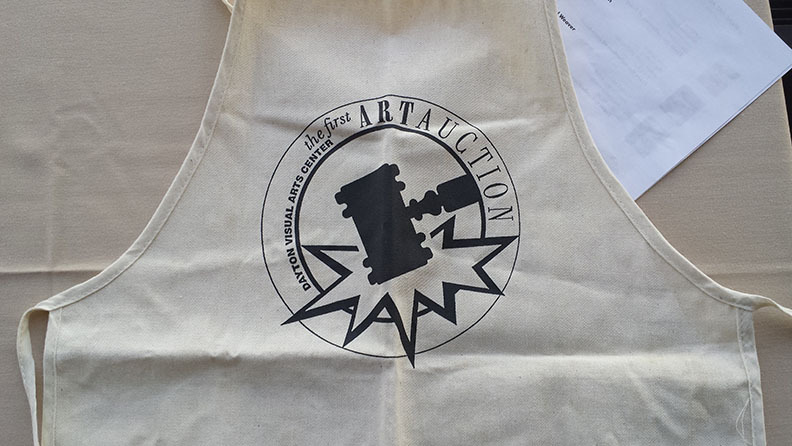 It was not long before the idea of organizing an auction where artists would donate work and the community at large could come in and bid on it was suggested. The first auction in 1994 was at the Dayton Art Institute. 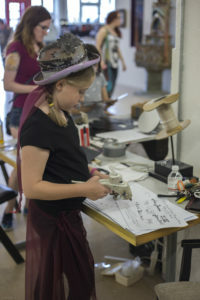 It was organized by artists and members Pam Hauk, Linda Lombard, and Ray Must, and it started a tradition that has helped build this community into a family over the last twenty years. Just one of the beautiful pieces on loan for the show, Caryatids by Don Williams. Everyone in the room had a story to tell. Each piece of art that silently drew all of the attention in the room belonged to a member. They sat as examples of some of the art that has been auctioned over the lifetime of the events. Eva Buttacavoli, the Executive Director of DVAC and host for the evening, did not just introduce each piece of art in the room, she was able to entice almost every owner to narrate the history of the piece and why they love it. Each piece was impressive, created by names like Andy Snow, Homer Hacker, and Palli Davis. What is equally impressive were the stories told by the collectors about the impact the piece had in their lives. Some did not just collect art from the artists, but were able to develop personal relationships with them. Relationships that led to deeper understanding of the art that was being produced. Some purchased from a variety of artists; some would buy every piece from one artist (if they had room in the house). As one of the collectors told her story, she spoke about how “DVAC becomes a part of your life” and how they “never buy work we don’t love to see every day.” Another woman spoke about how her children, growing up around all this amazing art, were able to not only meet these talented people, but pick out their work on the street. 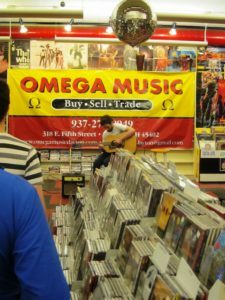 More than a few pieces were bought while the speakers spouse was away. There was a bond among all the people in the room, being either lovers of art, creators of art, or both. Many of the people attending that night had memories of DVAC that went back to the beginning. Ray Must was there, one of the original three creators of the auction and an artist in his own right. He has been an active member in the Dayton art community for decades as an artist and an educator at Wright State University. His works range from large scale murals in acrylic paint to smaller, more detailed etching. In the opinion of one of the collectors, “what Ray has done for the community cannot be measured.” One of his works, “Edwin Moses and the Dayton Carousel”, will be available at the live auction on April 25th. Bobette ”BK” Olsen was also in attendance, carrying a file that showed some of the history of DVAC’s shows. Names like Connie Hanselman, Ernest Koerlin, Abner Cope and Bobette herself showed up over the years of shows. Sculptor Susan Zurcher, was also there as an early supporter. 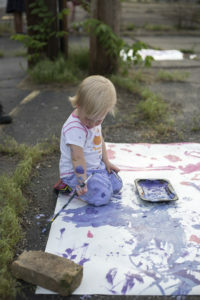 She chaired the second artist auction, helping to “expose all the hidden gems” within the city. She sees the organization as a microcosm of the city, “helping each other without blowing our own horns.” These three and many more have been involved with this organization over the years, building it slowly but surely. 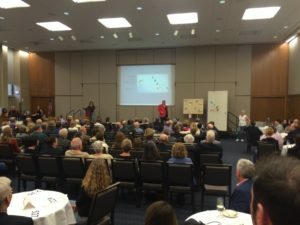 All of the people in the room that night helped build it from the ground floor of a donated space downtown to the top of the town. 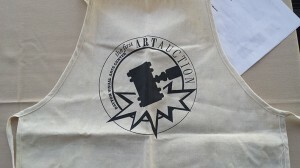 The apron from the first art auction. Kate Fodor’s darkly comedic 2007 character study “100 Saints You Should Know,” currently receiving a fine regional premiere at the Dayton Theatre Guild, brings faith, faithlessness and forgiveness to the forefront in an engaging and compelling fashion under the delicate direction of Ellen Finch. Alex Carmichal, who left an indelible impression earlier this season as the titular villain of the Dayton Playhouse’s production of “Dracula,” brings understated potency to his excellently conflicted portrayal of Father Matthew McNally, the play’s centerpiece. Grappling with unmentionable desires that betray his duties, a predictable yet reasonable notion, Matthew leaves his parish without a game plan for the future, causing him to question his beliefs as never before while returning to his childhood home for refuge. The reason behind Matthew’s hurried, vague departure, involving the provocative artwork of George Platt Lynes, is reserved for late Act 1, but Carmichal’s astutely perplexing nature remains thoroughly intriguing, especially as Matthew finds solace in reading “Dark Night of the Soul” and comes to grips with the acknowledgement that his spirituality, his connection to God, is completely broken. Amiable cleaning woman and single mom Theresa (a first-rate, emotionally distressed Katrina Kittle) inquisitively looks to Matthew for answers to her burgeoning thoughts of religion, but Fodor primarily keeps their budding relationship and insightful faith discussions ambiguous, which some may find perturbing. After all, this lonely pair feels very bonded as lost souls in search of intimacy and purpose, elements heartwarmingly fueled by Carmichal and Kittle’s innate chemistry. Kittle also establishes a wonderfully exasperating rapport with the sassy Corinne Engber as Abby, Theresa’s startlingly rebellious, foul-mouthed 16-year-old daughter who deeply resents her and their meager existence. Theresa and Abby’s bickering showdowns are off-putting (Abby is one of the nastiest characters to come along in years), but Kittle and Engber build to a heartfelt climax nonetheless as Abby particularly grows to understand the cost of being utterly mean-spirited for selfish gain. 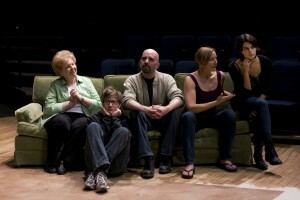 The cast also includes the very endearing Maximillian Santucci as the gawky, gullible Garrett, a sexually confused delivery boy ridiculed by Abby to devastating proportions, and the marvelously grounded Barbara Jorgensen as Matthew’s stern, caring, Scrabble-adoring Irish mother Coleen, who has difficulty grasping his sudden change of heart and the sheer importance of acceptance. Marcia Nowik’s efficient set as well as Patrick Hayes’ appropriate costumes and believably bloodied makeup for Santucci are also significant as this impactful tale of inner fulfillment runs its surprisingly heartbreaking course. “100 Saints You Should Know” continues through March 10 at the Dayton Theatre Guild, 430 Wayne Ave., Dayton. Performances are Friday at 8 p.m., Saturday at 5 p.m. and Sunday at 3 p.m. Act One: 60 minutes; Act Two: 45 minutes. Cost: $18 for adults, $16 for seniors and $11 for students. For tickets or more information, call (937) 278-5993 or visit online at www.daytontheatreguild.org. Also, in conjunction with the Dayton Visual Arts Center, the Guild will display the works of local artist C.A. Tiedemann in its lobby during the run of “100 Saints,” which contains mature subject matter. Happy Restaurant Week! Hopefully you have already started taking advantage of some of the great deals at our area’s fabulous restaurants. 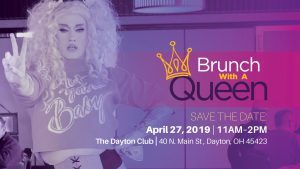 In addition to Restaurant Week, here are a few other options of things to do in Dayton. On Wednesday, celebrate the Submarine House’s One Year Anniversary (Beavercreek Bar and Grill), where they will have great specials, as well as prizes and raffles. During your lunch hour, listen to Frequency, an a’capella group who will be performing at Courthouse Square as part of The Square Is Where. Wish you could be like Tiffany’s and make your own jewelry? Consider heading to the Cannery Art and Design Center for Art by the Glass. Learn about how to shop at farmers’ markets and what questions to ask, all the while consuming a tasty beverage as part of Dayton Green Drinks at Company7 BBQ. Flock to Pasha Grill for their FLOC (For the Love of Children) Charity Dinner, which will help to support children who have been neglected, abused, or are in foster care. And if it’s not too hot, consider listening to music as part of Jazz on the Green at Yankee Trace or watching the Dragons play the Fort Wayne Tincaps. 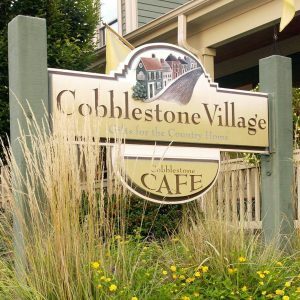 On Thursday, utilize what you learned on Wednesday at the Dayton Green Drinks event and pick up some fresh local produce at the Centerville Farmers Market. If you love wine but don’t want to break the bank, stumble your way to Arrow Wine in Centerville for a wine tasting featuring wines under $20. You will be able to drink wine AND exercise as part of Grape and Lotus: A Wine and Yoga Practice at Metropolitan Arts Center. For some live music, make your way to Dublin Pub to see Nick Mitchell or to RiverScape for their Big Band Nights featuring the Dayton Jazz Orchestra. In addition, the Dragons will continue their series against the Fort Wayne Tincaps. On Friday, be sure to be downtown, as that is where all the best bets are. Listen to another concert at Courthouse Square during your lunch hour for The Square Is Where, where Minions of Fate will be performing. 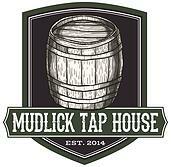 If you are a beer lover, you are in luck, as there will be an Epic Brewery Welcome to Ohio Party at Lucky’s. At Victoria Theatre, watch Young Frankenstein as part of the Michelob Ultra Cool Films Series. At Fifth Third Field, catch the Dayton Dragons as they once again play the Fort Wayne Tincaps. And finally, whether you are Irish or not, you will not want to miss the Dayton Celtic Festival! 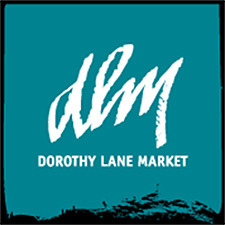 On Saturday, take the kids to the 2nd Street Market for Kids Day. I told you not to miss the Dayton Celtic Festival on Friday, but if you did, you must put it at the top of your list for Saturday. And if you already went on Friday, you can still go as well! 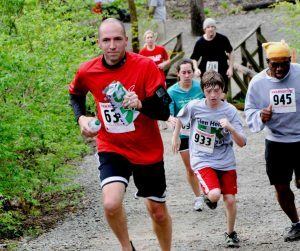 In addition to the many festivities already going on, there will be 5K Run/Walk in order to burn off the calories from all that Irish beer! Also at RiverScape, you will be able to take part in the Dayton River Ride. Over at Wegerzyn Gardens, watch A Midsummer Nights Dream, presented by Free Shakespeare. If you feel like catching a movie in an ultra cool place, then be sure to head to Victoria Theatre for the Michelob Ultra Cool Films Series, where Blazing Saddles will be shown. Art lovers should plan to attend DVAC’s 20th Birthday Bash. After all, who doesn’t love a birthday party? And if you’re caught up in good 80s music, then be sure to get your tickets to see 38 Special at the Fraze…and hold on tightly to them! On Sunday, start your day off right with the Dayton Celtic Festival Breakfast at RiverScape, followed by their Bike Ride. Then enjoy the rest of the Festival’s festivities. You will also be able to listen to live music at Stubbs Amphitheater in Centerville by the Sound Body Jazz Orchestra or at Riverfront Park in Miamisburg for the Pizzazz in the Park Concert Series featuring Chazz. And if you prefer to stay indoors, watch The Producers as part of the Michelob Ultra Cool Films Series at Victoria Theatre. Plus…don’t forget that this week is Restaurant Week, so be sure to make reservations at your favorite restaurants all week long! What’s the definition of a farmer? One who is outstanding in his field. First off, I would like to say congratulations to the Dayton Dragons on setting the national record for sports sell-outs this past weekend…what an accomplishment! We do truly live in a great city! And I’d like to prove it once again by letting you know about some of the great things going on here this week! 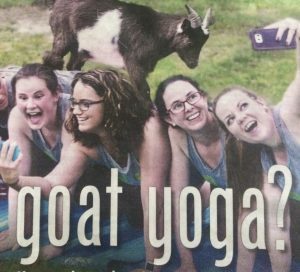 On Wednesday, take a break from work and head to The Square Is Where… Yoga Class from Practice Yoga at Courthouse Square. If you haven’t been getting enough beauty sleep lately, consider going to La Comedia to see Sleeping Beauty. Listen to music at Yankee Trace with Jazz on the Green or at Veteran’s Park Amphitheater with The Dark Star Orchestra. And if you’re in need of a good laugh, then head to Wiley’s for their Dirty Little Secret Superhero Show. On Thursday, there are several great happy hour options so you are going to have some tough decisions to make! If you are an enthusiastic young professional, join Generation Dayton at El Meson for Thirsty Thursday. It’s Thursday Night Live at the Moraine Embassy, so let DaytonMostMetro.com’s very own Bill Pote and Lisa Grigsby help take care of you, as they will be the celebrity bartenders on hand. Grab dinner and drinks at one of the fabulous restaurants at The Greene such as McCormick & Schmick’s and then sit on the green (literally) to watch as Ed Kowalczyk, the lead singer of Live performs. 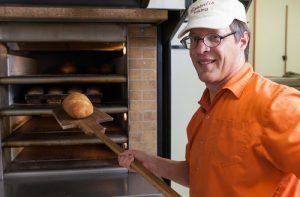 Check out three of the Oregon District’s new businesses as part of their Progressive Open House, where each business will have live performances by jazz and classical musicians, as well as raffles! Bring the whole family to see Joseph & the Amazing Technicolor Dreamcoat at The Salvation Army Kroc Center – tickets are FREE! Or help support the Leukemia and Lymphoma Society by getting your tickets to see ‘The Sound of Music’ at Epiphany Lutheran Church. 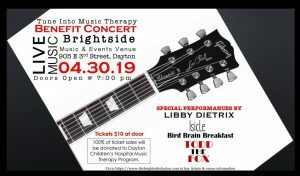 And finally, listen to live music at the Dayton Art Institute for a Twilight Concert or at RiverScape for their Big Band Nights featuring the Eddie Brookshire Orchestra. 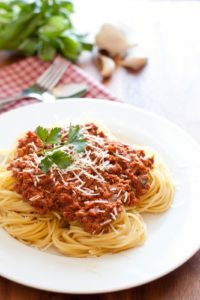 On Friday, bring your kids to the PNC 2nd Street Market for Pasta Making for Kids…afterall, wouldn’t it be nice if they made you dinner for a change?!?! If you love biking, consider taking part in the Greene Trails Cycling Classic at the Greene County Fairgrounds Recreation Center. Although this is a four-day event, you are able to “Design-A-Ride” that fits your schedule. Art lovers should make plans to attend the 20th Annual Open Members’ Show: Light at the Dayton Visual Arts Center. Head to the Beavercreek Kroger for their Wine and Food Extravaganza. Once again, you will be able to support the Leukemia & Lymphoma Society by going to Epiphany Lutheran Church for The Sound of Music’. 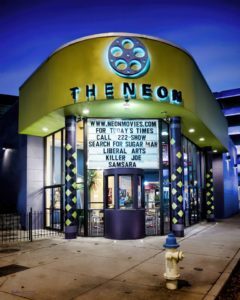 Have a nerds night out at Xenia Area Community Theater as part of Nerd Comedy Night. If you prefer to be cool, head to Victoria Theatre to see “Some Like It Hot” as part of the Michelob Ultra Cool Films Series. And if you actually do like it hot, then make your way to Bella Villa Hall for the The Bocce Classic XVI. Fifth-Third Field, the Bob Ross Classic will be going on, which is an All-Star Baseball Game for local high school baseball players. And if you would like to watch some great fights, head over to Drake’s Downtown for Fight Night…just be sure you don’t get into one yourself! On Sunday, the Fraze will be having WTUE’s Breakfast with The Beatles and The Beatleburys. Baby you can drive your car there…sorry I’m not going to let you drive mine! If you would rather ride a bike, then participate in the Greene Trails Cycling Classic, which will still be going strong. Watch belly dancers and fire jugglers, listen to live music, and MUCH more at the Fling in the Springs (downtown Yellow Springs). A trip to Dave Hall Plaza for the Downtown Summer Music Series – Michelob Dayton Blues Festival is a must for all blues fans out there! You will also be able to listen to music at Stubbs Amphitheater in Centerville (The Termites) and at Riverfront Park in Miamisburg (Pizzazz in the Park Concert Series: Paragon Quartet). And if you’re not the outdoors type, then you can go to Victoria Theatre to see “Some Like It Hot” as part of the Michelob Ultra Cool Films Series or to Epiphany Lutheran Church for The Sound of Music’. Why did the coach kick Cinderella off the baseball team?